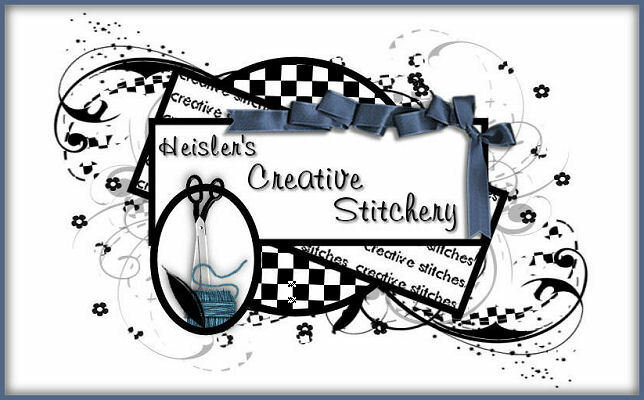 Ok, I went to Go Daddy to try to fix the Plesk problem and now my domain name of heislerscreativestitchery.com should send you all here to this blog instead of a page where you choose which of my 2 mirror sites you want to try going to. Finger's crossed it works! I used to be really good at writing code for web sites and knowing what to do to get everything running correctly but got away from it when yahoo shut down all the geocities sites. I had 4! If you look to the left you'll see graphics that link to both of the mirror sites. Right now I don't know what's going on at tripod lycos but I haven't been able to access it all day so it's a good thing the webs site is still up. 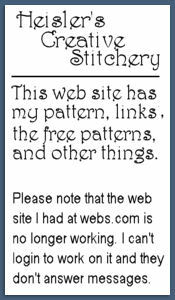 This is why I'm really considering adding pages here with pics of my patterns so you'll see what all I have for sale at etsy and other places on the web. Ok, here's the problem, My domain is thru GoDaddy cause they offered really good prices and free web sites when all of us left yahoo after they got rid of their free sites. Sorry for any probs this causes any of you.